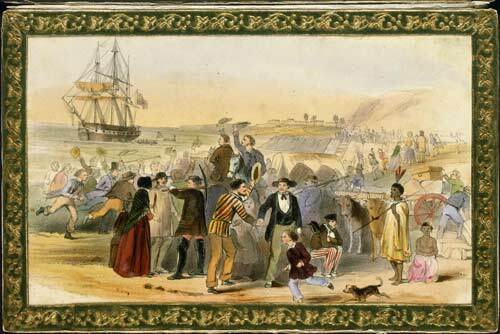 This lithograph from the 1850s is probably a picture of New Zealand settlers about to return to Britain. They are being farewelled by a gold miner (with the pick) and a Māori man. However, it is also possible that it is an arrival scene. Certainly the 1850s and 1860s saw many arrivals and departures from New Zealand. From 1853 to 1870 some 250,000 people came to New Zealand, but around 100,000 disappointed people left.